This is a step by step how-to to help test how well your Moodle can cope with a certain number of users. Now personally, I use Amazon cloud servers and jmeter for testing Moodle performance with my clients but this blog post is certainly a good read although it is for Moodle 1.9. 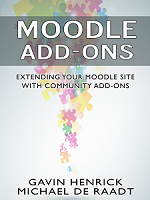 Jenny Gray covers the topic of custom fields / metadata which arose the recent Moodle developer meeting. This is an interesting area and one to watch. Although this is from 2 months ago, I think it is a good one to highlight as it tackles some really big aspects of ongoing code development which relates to Moodle development as well. Hans de Zwart blogged a session he attended about MOOCs at Learning 2012. As I recently took part in a MOOC, this post drew me in and really added some perspective on the whole area. Know what a MOOC is or not, worth a look. Mike Churchward is at it again with another multi-part series on Moodle development this time covering the development needed to have Blocks from Moodle 1.9 backups restore correctly in Moodle 2.